Two summers ago, I spent a month clocking four thousand miles on my custom W650. I camped in deserts, forests and up high in the mountains - they were the coldest nights by far. Wherever I was, as the hues warmed and shadows lengthened, at the end of each day I would retrace the things I'd seen and the people I'd met. The ritual of dinner became the backdrop to this play. The miles would take their toll and after setting up camp, I often found that I only had the energy to cook something quick and easy. The landscapes continued to evolve and inspire and as they did, it became clear that the food I was eating was being left behind. Every evening as the broken record slipped towards the same basic meals, I'd scratch my head to think of what else I could add to the menu. I mentioned this to Jack, a friend of mine who a few years ago, co-founded an award-winning restaurant. When it comes to food, he's an encyclopaedia. Sharing a passion for travel, he understood. It wasn't long before we'd hatched a plan to fine-tune a couple of recipes that could be cooked in one pot at the side of the road. At the time, Jack was in the North West of Scotland, overhauling his 1962 wooden Folkboat Sonos ready for the summer. I'd wanted to ride up to Scotland for a while and so it was a no-brainer, we set a date and I loaded my bike. After an uneventful day crunching miles, I counted my eggs too soon. Overnight, the temperature dropped ten degrees and the charts showed that conditions were set to deteriorate further North. The treasures of the Highlands were in plain sight but with a way still to go, I had a gauntlet to run. As I made progress, driving wind and rain sunk in their claws - a stuck carburettor float was the curveball that topped it all. Cutting my losses early to find shelter was the best decision I made that day. By morning, dry and with the worst of the storms past, I was in the clear. Following the contours around Loch Lomond, I learnt afresh why Scotland is so special. The pine forests that bordered the road stepped back to reveal a vast land sprinkled with vibrant pockets of mustard Gorse. The mountains rolled back their shoulders on my approached to Glencoe, stretching up until the clouds acknowledged their stature and crowned their peaks white. Riding amongst giants, I continued west. The Applecross Pass switched back and forth as it climbed the towering faces of Bealach na Bà. At the top of the pass, I stopped to look back along the valley. It's a place that I could feel the weight of time. 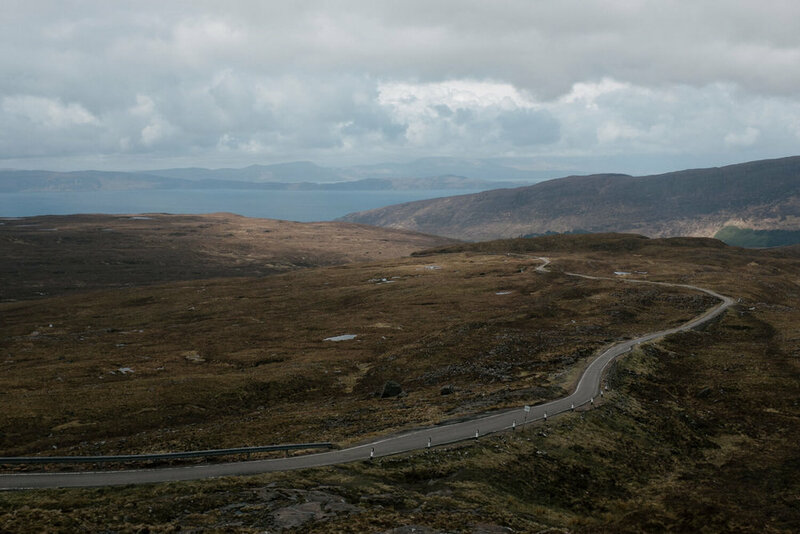 "The Applecross Pass switched back and forth as it climbed the towering faces of Bealach na Bà. At the top of the pass, I stopped to look back along the valley. It's a place that I could feel the weight of time." I arrived to meet Jack as his boat was being lowered into the waters of Loch Broom. We hadn't firmed up our next move but on hearing about Isle Martin, an uninhabited knuckle several hours sail around the headland, the decision was made. After laying in supplies, the next morning we slipped anchor. The slower rhythm of the wind was a welcome respite after four days in the saddle. We rounded the back of the island and a scattering of empty cottages came into view - a reminder of the island community that once devoted themselves to milling flour in the forties. 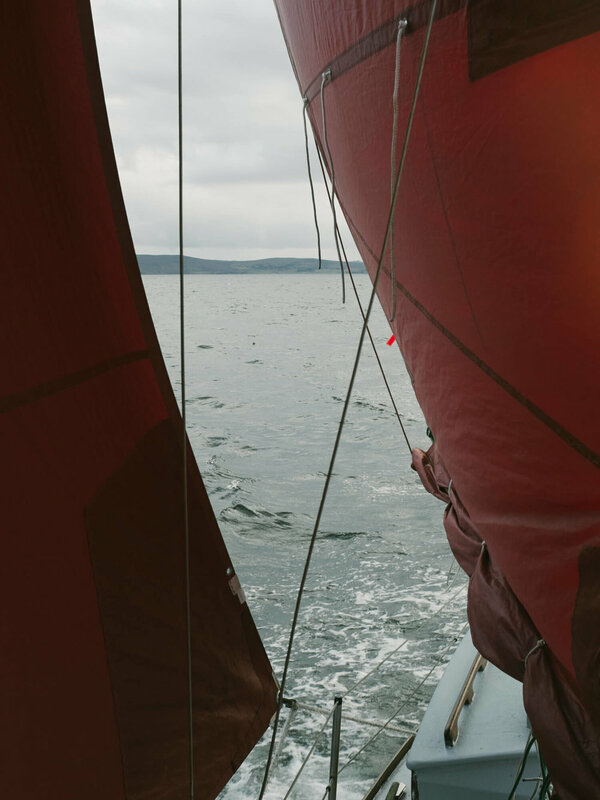 After mooring, with our camp stove, two small pans and a pencil-case of utensils in hand, we crossed the island to a pebble beach that looked out to the Hebrides. The low cliffs cast long shadows and Jack prepared a hearty bean broth with smoked haddock that had been caught on Scotland's East coast. This was important to us. We're both passionate that when travelling, food should connect to the part of the world you’re passing through. Both of these recipes were chosen because the ingredients can easily be swapped for whatever's to hand in a local market. A bracing night aboard Sonos was followed by a welcome hot breakfast cooked in the old corrugated schoolhouse. Inspired by a Ukrainian recipe uncovered by Olia Hercules; tomatoes, bacon, and the last of yesterday's bread were fried in our skillet with eggs laid over and a handful of fresh herbs to finish. Perfectly setting us up for the sail back to the mainland. Any trip that points North requires a roll of the dice. As I turned my bike to face the 600 miles home, it felt like this gamble had paid off. Having been through a tough couple of days at the start, I had a sense of accomplishment like no other. The sort you only get when you’ve seen something through to the end. Heat a saucepan over a medium and add a splash of olive oil. Fry the chopped onions for 10 minutes avoiding browning them. Add the vegetable stock and beans and bring to a gentle simmer. Next, add the haddock and cook and for a minute before adding the chopped spring greens. The haddock is ready when it begins to flake and the greens should be bright green and tender. Cut the lemon in half and stir the juice through. You could also scrape a sharp knife at a right angle across the lemon and add the zest to the pan. Add the chopped parsley, season with black pepper and salt to taste. A handful of Coriander, Mint & Parsley (whatever you can get your hands on). 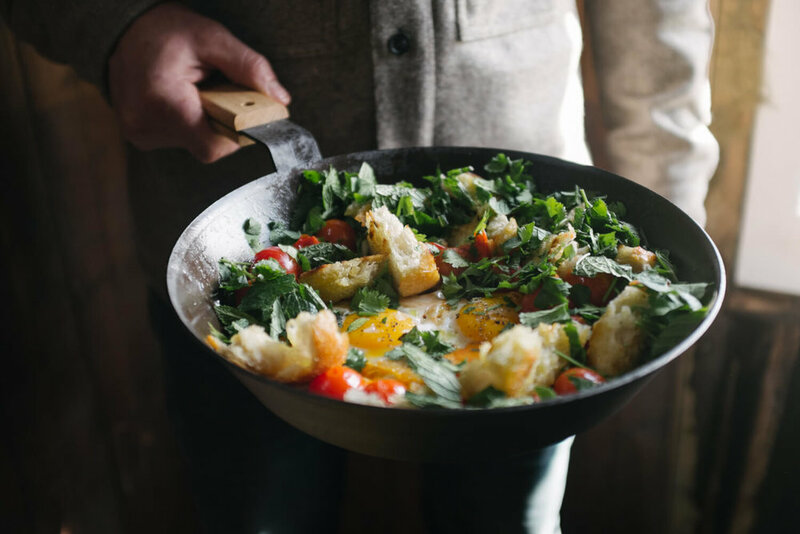 Place a frying pan on a medium heat and add a splash of olive oil. Throw in the torn bread and fry for a few minutes until the edges turn golden but the centre is still soft. Remove the bread from the pan and set aside. Add the bacon and fry until it begins to colour before adding the halved cherry tomatoes. Once the tomatoes have begun to sizzle and soften, make two wells and crack in the eggs. Roughly chop the parsley, mint and coriander while the whites of the eggs begin to set. Slot the chunks of bread back in around the eggs. Season the runny yolks with a little salt and give the whole pan a good couple of grinds of pepper. Scatter the herbs over the top and serve. We’d like to thank to Pole & Hunt and Netherton Foundry for supporting this trip. Here are a few items from our range that we couldn't have done without. If you know anyone else who would be interested in this story, please feel free to share this with them.